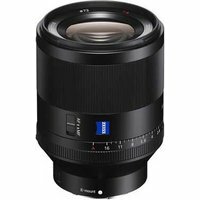 With its fast f1.4 maximum aperture, standard focal length and Zeiss Planar optical design, the Sony FE 50mm f1.4 ZA lens is a high-performance prime lens designed for full-frame E-mount photographers. Its dust and moisture resistant design makes it perfect for everyday shooting, while its large f1.4 aperture allows for working in low-light conditions and provides greater control over depth of field for stunning selective focus imagery. Its 11-bladed aperture ensures beautiful bokeh, whilst AA and ED glass elements reduce spherical and chromatic aberration.